We will be returning to Jordan in the second week of October to film our new fitness DVD at the Movenpick Resort at the Dead Sea. The www.OneMileRunner.com film crew will be boarding the plane for the 14 hour plane ride to Dubai followed by a 3 hour plane ride to Amman, Jordan. 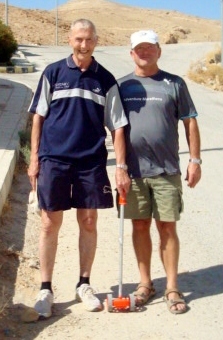 After completing 4 different and unique one-mile events over the last 4 years, it is now time to share the reasons why I have not been injured during these trying tours. “Body Protection” will be broken down into three levels – beginner, intermediate, and advanced and is for athletes of all ages. We are spending this week on the beautiful island of Martha’s Vineyard off the coast of Massachusetts leading a tennis and fitness clinic. I will spend a week in Sarasota preparing for our upcoming DVD. 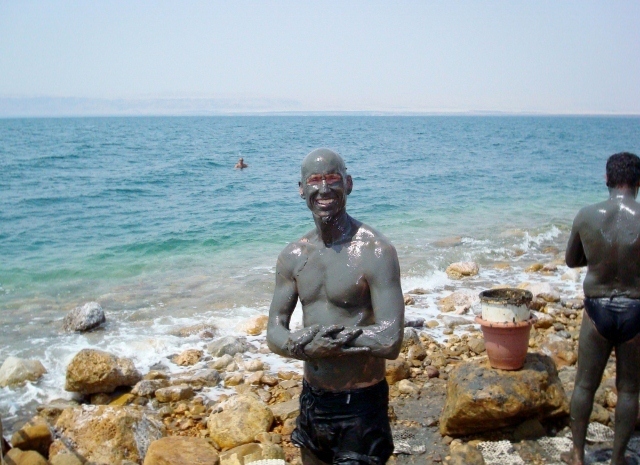 Then we are off to the lowest place on earth, the Dead Sea, to create a DVD for you all to utilize in order to stay injury-free in your chosen sport. We arrived in Jordan after a few days in New Delhi. 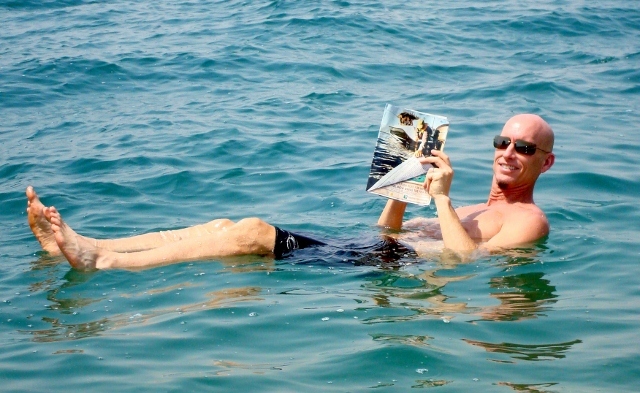 We came immediately from the airport to the Dead Sea as it was a dream of mine for the last 25 years to come and float in the salt waters of the famed Dead Sea. The Dead Sea has a long heritage for many thousands of years from Herod the Great to King David. It is really a lake not a “sea,” bordering Jordan and Israel. It is the lowest spot on earth as it is around 1200 feet below sea level. You have plenty of oxygen for running here. Due to its super salinity, no sea life can live in waters that are almost 34% salt. So they call it the Dead Sea, but I feel that it is the opposite: a fountain of youth because it cures so many common ailments known to man. I cannot float in any water, but I do here. You just lie on your back and float, then smear this incredible mud that they get a few meters below the bottom all over your body. You let it bake in the sun and viola – your skin, joints, etc feel better. It is a natural therapy that is so rejuvenating. We travel to Amman the busy capital city of Jordan to meet up with our tour group. 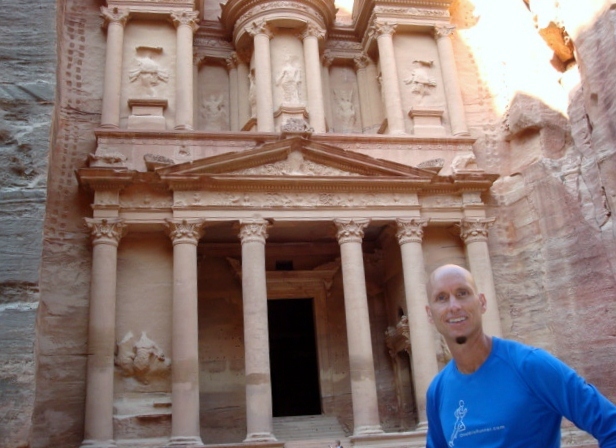 Then we travel 4 hours south to Petra where I will race a mile of the Petra Marathon on Saturday. 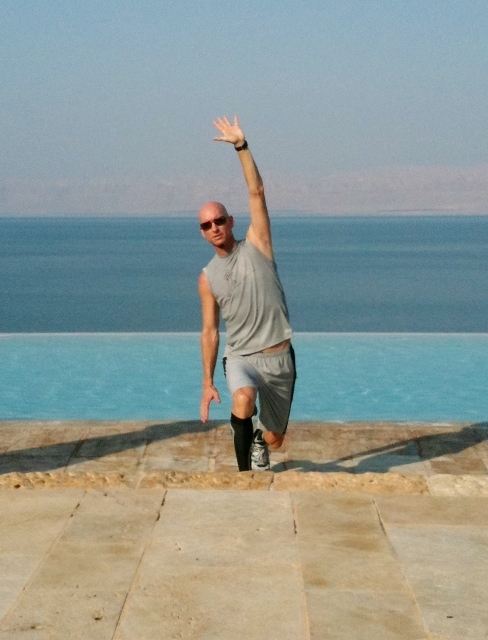 It will be an exciting place to finish the 2011 www.OneMileRunner.com tour of “5 Wonders Under 25 Minutes.” I hope my few days at the Dead Sea has rejuvenated my body after our time in India so I can finish strongly in the last race. For all of us at www.OneMileRunner.com, it has been one of our most interesting weeks on tour. Overcoming my sickness, arranging a difficult race under strange conditions, and finding the courage to conquer my fears, it has been a week in India that we will always remember. Delaying the race until Friday worked out great as the road to the East Gate of the Taj Mahal was more free as The Taj is closed on Fridays. We had two bicycle rickshaws surround and protect me as I raced down the road to the East Gate. I lost one of the bicycle rickshaws after the first minute as he underestimated the speed required. The other driver, Bobby, did a wonderful job and stayed with me for the entire race keeping out of harms way of numerous wayward dogs and the wild monkeys that surround the walls around the Taj. The Taj Mahal is even more beautiful than I remember 24 years ago when I came here for the first time when I coached the Junior Davis Cup Team in Chennai. Sekyen and I both agree that it is the most magnificent building we have seen. 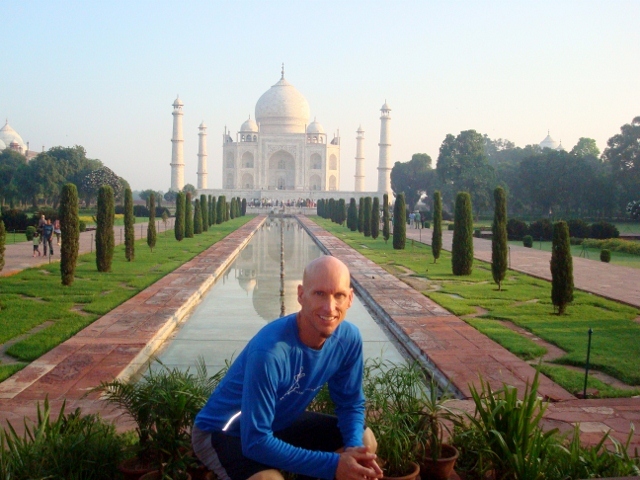 The Taj Mahal meaning “crown palace” is a 400 year old mausoleum in Agra, India. Mughal emperor Shah Jahan took 22 years to build the Taj Mahal in loving memory of his third and most beautiful wife, Muntaz Mahal. Muntaz Mahal died after the birth of her 14th child. The intricate details within the Taj Mahal’s walls are simply amazing. If you have not been to see this incredible Wonder of the World, it is indeed worth the trip. We finally are traveling back to New Delhi to catch a flight to Dubai. We will stay there for a day and fly to Amman, Jordan on Saturday. 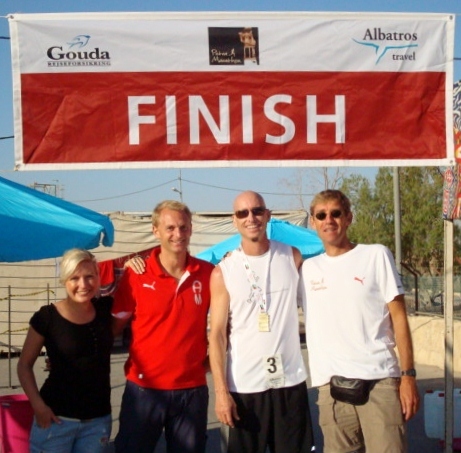 We hope to spend a couple of days training at the Dead Sea before we meet up with the marathon group for the Petra Marathon on September 7th. Thanks to all our readers that have wished and prayed for me this week for a speedy recovery, your support was much appreciated and effective.